To start, simply press the Focus button. Based on the 25-5-4 focus-break method (e.g. pomodoro or time boxing). 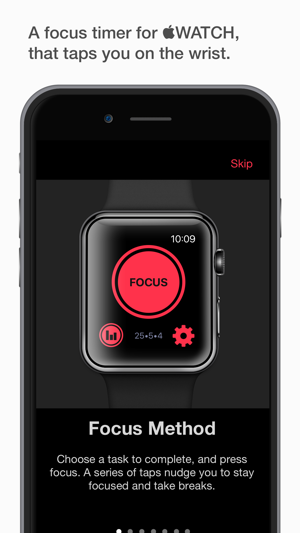 After 25 minutes of focus, SILO taps you on the wrist to take a 5 minute break. After the break, SILO taps you again reminding you to get back to work, and the cycle repeats a total of four cycles. Everyone works differently. The focus and break timers are adjustable (right from your Watch) allowing you to try different intervals, and find your rhythm. While you focus, SILO tracks your work-hours. Hours are automatically calculated at the end of your sessions. There's nothing else you need to do. Check out your stats on your Watch to see your bi-weekly hours worked. Complications on the Apple Watch face is a quick way to check the timer status—and take you directly to the app. 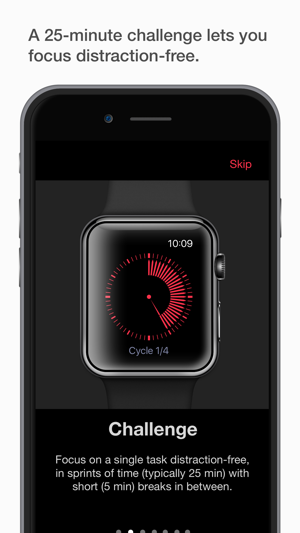 Add the SILO complication from your Watch or the Watch app on your iPhone. 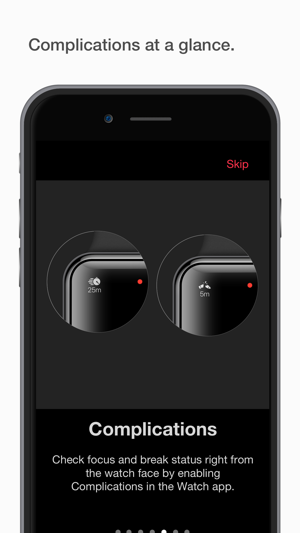 Using the power of the Apple Watch Taptic Engine, SILO can silently nudge you without distracting others around you. 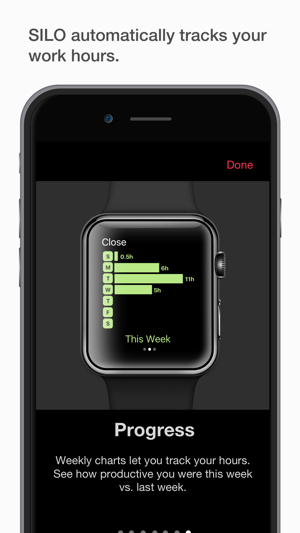 Using SILO on the Apple Watch lets you work in quiet spaces (library or office) without disturbing others nearby. Also, distraction-free mode (Airplane mode) mutes incoming notifications so you can focus without interruptions from your phone. 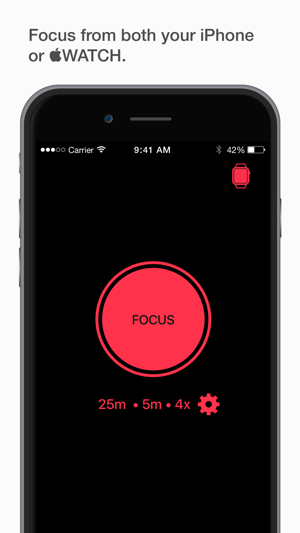 **New** now with airplane mode enabled, SILO prevents distracting notifications from interrupting your focus session. * Simple focus-break interval timer. * Haptic feedback for silent working. 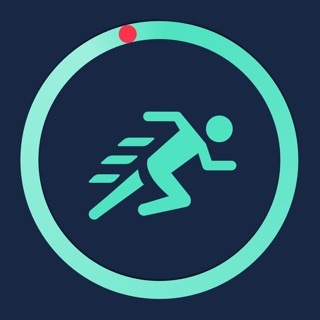 * Standalone Apple Watch app. * Complications for Apple Watch. * Adjust timers from Watch. * Use iPhone to focus if no Watch available. * Skip to focus/break for when you're on a roll. * Session pause and resume. In a distraction abundant world, focusing and taking breaks keeps your mind fresh and sharp. With SILO at your side (or on your wrist), it's like having a personal motivator—keeping you focused on the task at hand. The most recent update did the trick--I haven't had a problem of any sort. Kudos to the developer for being so responsive and quick to find a fix. I use this app everyday. It's simple and impossible to get distracted by (with the update), which is ideal if you're easily side-tracked like me. It's also way more customizable than some of the other apps I looked at. I'm going to leave my original review to draw attention to the developer's attentiveness. Increased from 4 stars to 5. This is a simple and effective app that does what I want it to. The most recent update has fixed the crazy end-of-cycle bug that previous reviews mentioned for about 50% of the time. Completing a cycle now induces the equal parts of panic and adrenaline of a game of roulette--rather than the previous sense of impending doom. It's not a totally catastrophic bug anymore, just quite annoying. It seems, however, that the most recent update wrecked havoc on the haptic feedback tap marking each focus/break transition. It's the primary reason I chose this time tracker over others. 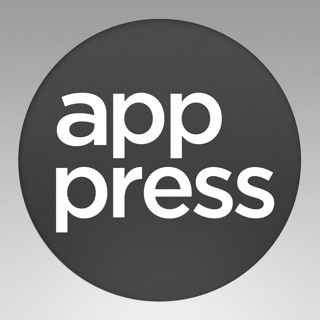 My hope is that the developer, who seems fairly responsive to reviews, can rectify the haptic bug quickly. Bearing in mind the unfortunate haptic hiccup of the most recent update (and the moderate success of the other bug's fix), I nevertheless recommend this app to folks looking for an efficient, customizable tool for time management. Thank you for the support! Please check out the latest update—hopefully the elusive rogue-notifications are no more! Not working well with my Apple Watch. Thank you dev for responding. I have raised the my rating from my original 1-star because I believe it is something with Apples software that is causing the bug. The symptom I have originally described has happened with other apps as well, not just yours. Basically the only fix is uninstalling and reinstalling again... unfortunately it just stops working randomly and the only fix is uninstalling and reinstalling again which is a real hassle. Again this is happening with a lot of timer apps including fitness timers on my watch not just yours. The fix is always uninstall and reinstall. My next step in trouble shooting is completely resetting my watch and downloading everything again. I am getting neither a notification nor haptic feedback after the end of work or break times on my Apple Watch series 1 with IP7+. I used to get both haptic feedback and notification every time. Tried uninstalling and reinstalling yet this didn't work. My first exposure to the timed break technique was as a quintet of ten minute + two minute work-break periods per hour. Silo works well as a Watch-implementation for that, and even supports the 52+17 period that Nicholas Bloom, James Liang, John Roberts, and Zhichun Jenny Ying found most effective in their 2013 experiments. Pause, resume, skip are all on the wrist. Less risk of distraction from Watch than from iOS, too.